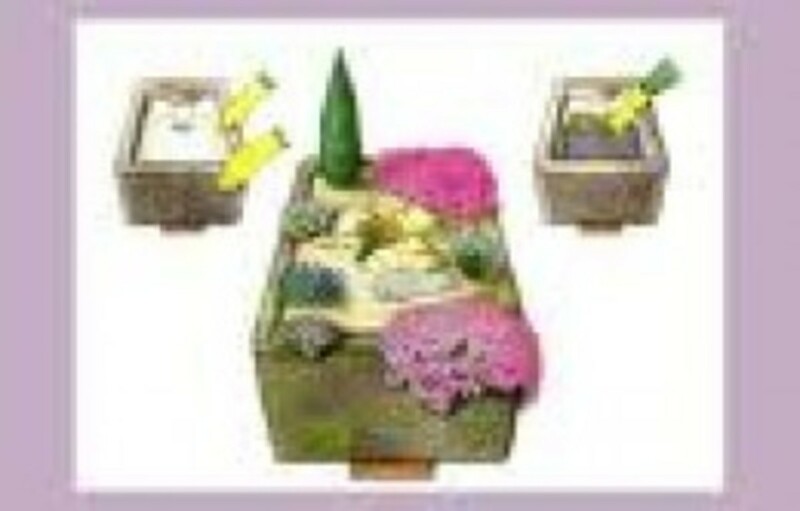 Miniature Garden: How to Plant Trough and Sink Gardens? 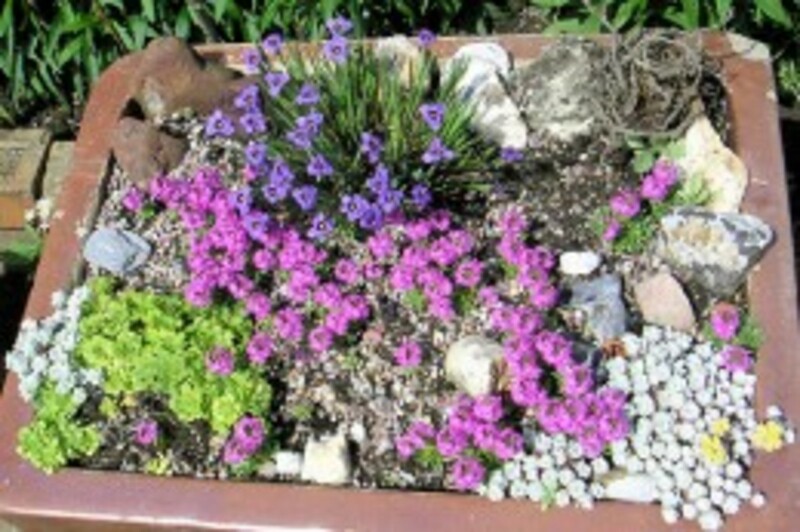 Miniature plants lend themselves naturally to miniature gardens, and one of the most fascinating ways of growing many of the smaller alpine treasures is in the stone sinks and troughs. The idea for such gardens apparently first originated with Mr. Clarence Elliot, famed alpinist decades ago, who awakened interest in them through his writings and exhibits at the Chelsea Flower show. Since those earlier days, interest has not flagged for here is a way of having a garden of manageable size, easy to tend, and where certain treasures of the alpine plant world can be grown more easily than anywhere else. The sinks are the stone sinks used in kitchens before the days of the glazed porcelain, fireclay or stainless steel. The troughs, deeper vessels, were the cast-outs of the farm, erstwhile feeding throughs of horses, cattle and other farm animals, variable in size and shape or less often a trough that at one time graced the outdoor yard pump. At one time available for a song, today they may have to be searched for more diligently and paid for less blithely. But they can still be found where the demolition of old houses is taking place, forgotten in some farmyard, country junk yard or at the alpine nursery. 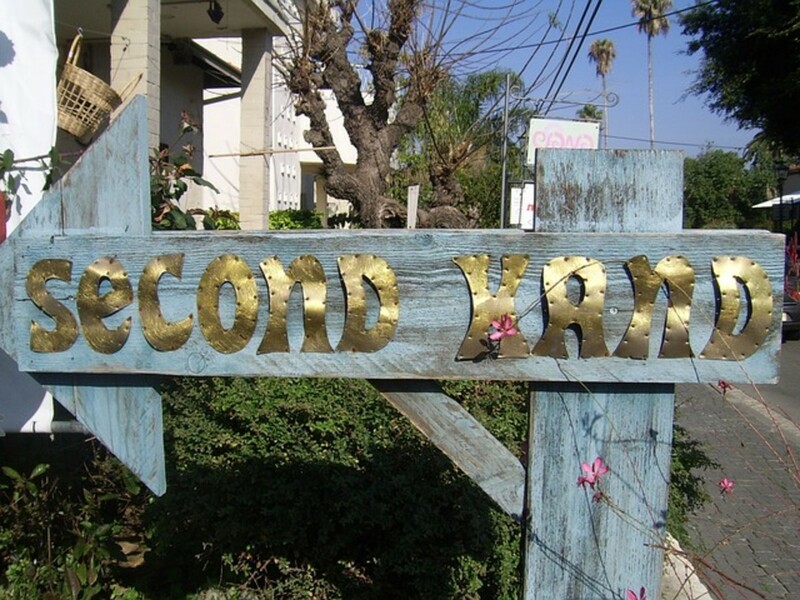 They are permanent acquisitions for the garden, and signs of wear usually make them the more appealing and amenable for garden purposes. A single sink or trough can make as fine and as significant an ornament as a statue, and a pair, flanking a porch or entrance, keep their symmetry far better than matched shrubs or conifers. The sinks are usually made of hard sandstone or millstone grit, less often of limestone; natural stones congenial to plants. In fact, one of their chief recommendations is that alpines do exceedingly well in them, and since they come so completely under the gardener’s control, the more difficult and rare species, easily lost in the larger rock garden, can be grown here. 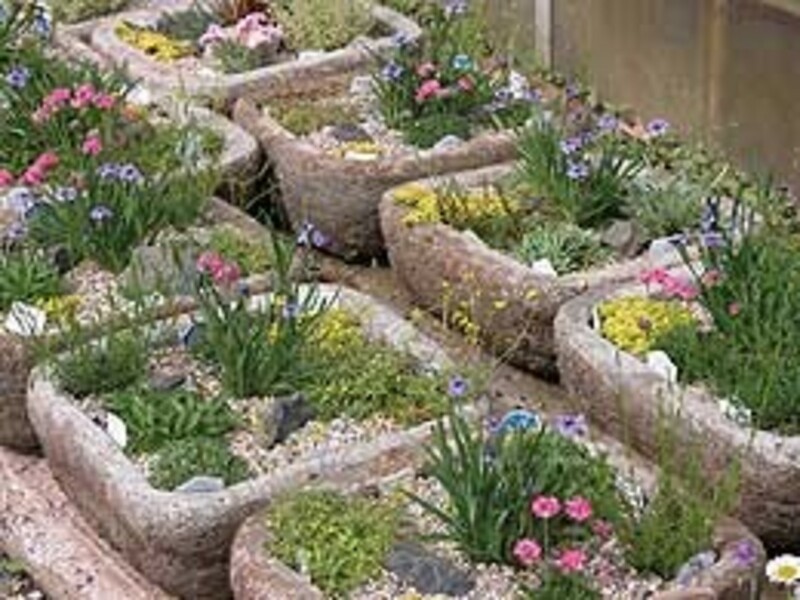 Sinks and troughs come in various shapes and sizes, but all are usually adaptable for use as miniature alpine gardens. If they are dirty and much spoilt with green algae growth, moss and encrustations, they can be cleaned by scrubbing with an ordinary solution of domestic bleach, followed by a hosing down with clear water. The basic essential is good drainage. Sinks usually have a drainage hole to the middle or at one end. All the shallow sink needs is for a simple herringbone of V-cut channels to be made with a chisel in the base of the sink that will carry water to the drainage hole. Then if the sink is placed on its supporters with a slight inclination to one end and the position of the drainage hole, it will drain perfectly. Troughs often have no drainage holes, in which case one or more must be cut with a stone mason’s rose head drilling chisel and heavy hammer. If the base of the trough slopes to the center, a single hole in the center will suffice; otherwise drainage channels may be cut to the hole, or holes made at 6 inches apart over all the base. Where to Place the Sink/Trough Garden? 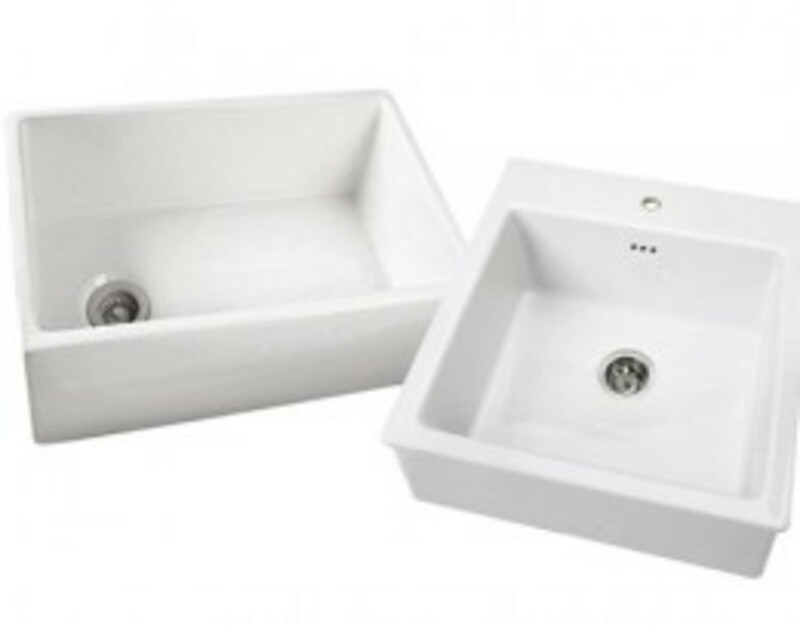 When the sink or trough has received these attentions, it is best placed in its permanent position. If there are more than one, they can be placed on low walls. A single sink or trough garden can become a feature on a terrace or be used instead of a sundial, or to terminate a vista at the end of a path. It should be placed in good sun, but not exposed to weather extremes of great heat, gales or saturating rainstorms. There should always be the possibility of clear sky above, away from the eaves of a building or the branches of overhanging trees, with their menace of drip. The single sink or trough is best placed on some form of support to bring it nearer to eye for viewing and nearer to the hand for tending. The support can take the form of a pedestal built with stones to match the trough, cemented together. A long vessel can be best rested on two columns, one at each end. Bricks are less in keeping, unless they can be given a coating of cement plaster and ‘pebble dashed’ with chippings of matching stone. 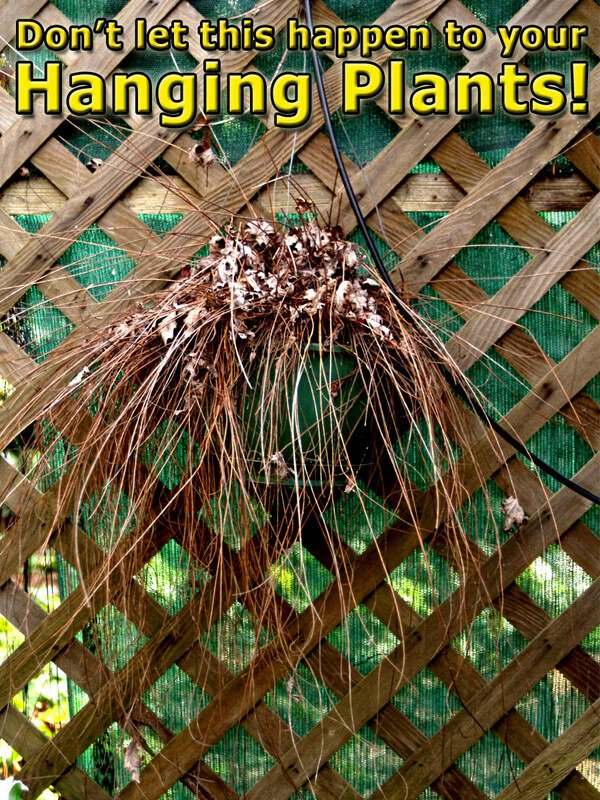 Raised off the ground, the plants are less likely to suffer from the attentions of slugs, snails, mice, dogs, cats and ants. When placing the sink or trough in position, care must be taken to see it is leveled or given the slight slants to make the drainage work perfectly, and this should be tested with a bucketful of water before anything more is done. Any collecting of water in pools on the floor of the stone vessel means stagnancy and slow death of the plants. Each drainage hole now needs a cover of perforated zinc, wire mesh or nylon mesh or an inverted crock, followed by a layer of drainage material, about one fourth as deep as the vessel, consisting of small stones, or plant pot crocks, covered by leaves or peat. The sink trough should then be filled with a suitable soil compost – say, four parts by bulk sifted loam or topsoil, two parts leaf mould or peat, two parts sharp silver sand or fine grit, with 3 ozs. of bonemeal to the bushel (8 gallons) – to within two inches of the top. If the lime intolerant plants are to be grown, then lime free acid loam must be used. Otherwise, a good handful of small limestone chippings is a useful addition. If the soil fraction is heavy, a little more sand can be added. The next step is to make the rock garden in miniature. For this, small pieces of rock are needed. Undoubtedly, fragments of water worn limestone are most picturesque, but other stones can be used, particularly if chosen with roughened and weathered faces. Tufa stone is excellent for limestone tolerant species. The arrangement of the rocks should be to present a pleasing landscape. The principles are similar to the already given for building a rock garden out of doors. There is however, ample room for individual expression. It is a good plan to take the largest rock first and place in position as crag or outcrop, and then with smaller outcrops lower down, to stimulate a great mass of rock breaking through soil. You may have to move the rocks around until you have a pleasing assembly. Another scheme is to plan the rock fall from one end or corner, with a ravine running through and out on to a plain or miniature alpine lawn. On one side, the rocky crags may rise higher than on the other, with outcrops abutting the plain. It is a mistake to attempt to fill the entire sink or trough with rock. When the final positions of the rocks have been decided, they should be firmly based on the soil, given a slight tilt backwards and with strata aligned, more soil should leave the rocks looking as if they arose naturally out of the soil. A thorough watering should come next, and when this has drained through, planting up can begin. For the widest range of plants, the sink should have an aspect facing west, but exposures to sun and shade should be taken into account in choosing plants. Which plants will be the best for a sink/trough garden? 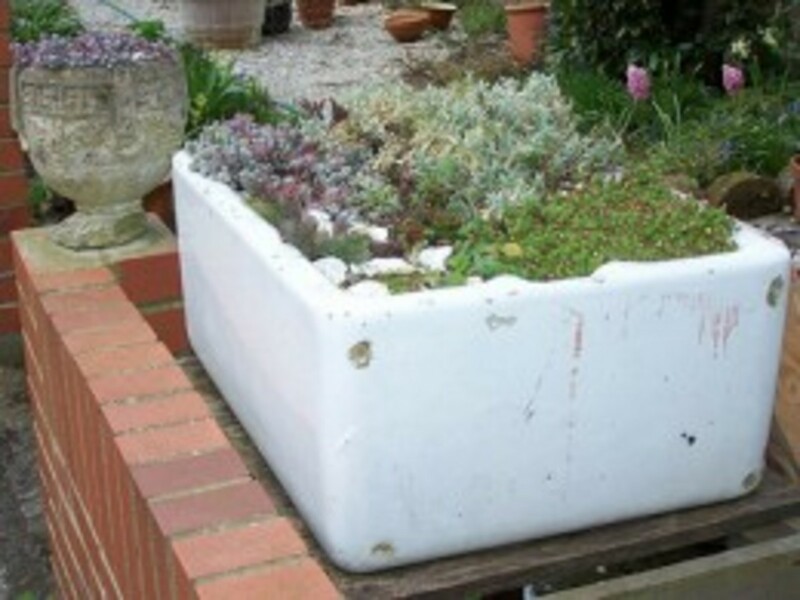 It is of course, perfectly practical to devote a sink or trough to a single genus, such as Saxifraga and Gentiana, or a species normally difficult to grow elsewhere. This means, however, that the garden will have one period of maximum color and beauty, and months when there will be little to show at all. A sink or trough may be though too precious to devote to all one kind of plant. A useful alternative is to make the garden in a large clay pan, made of the same brick earth as clay pot. These pans can be bought in round or square shapes and are excellent for miniature gardens, treated in the same way as sinks or troughs. In a mixed planting, it is best to aim at a fairly full flowering for spring and early summer, with a few specimens to give accents to color later, and then rely on the odd dwarf conifer or miniature evergreen, with plants of evergreen foliage to maintain attractiveness in winter. The miniature bulbs such as crocus, Cyclamen neapolitanum, Cyclamen orbiculatum v. coum, Cyclamen atkinsii and vars., and dwarf narcissi, can be planted to give color in autumn and early spring. Although it is possible to plant most of the alpines, the sink and the trough garden is the peculiar province of the choicest of the choice and the miniatures of the miniatures among alpines, and the list that follows is a selection of selections with which to start. 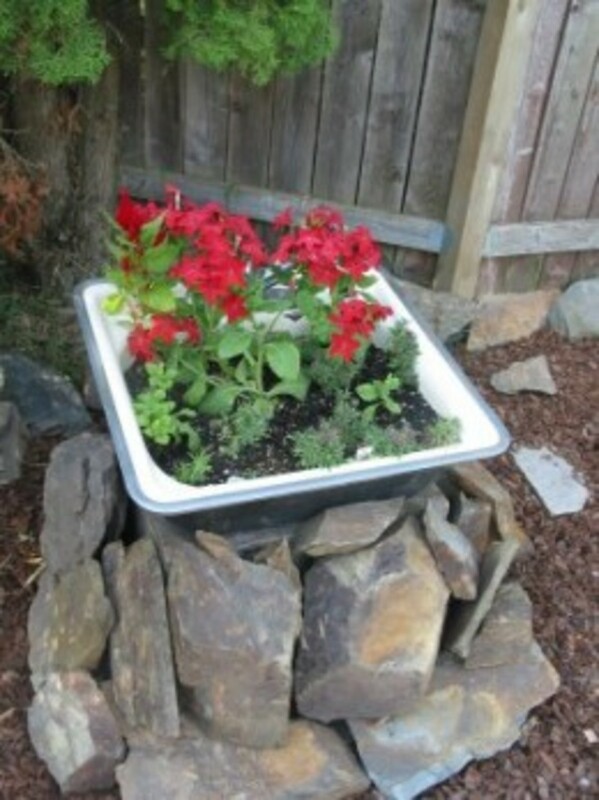 Planting of sink garden is best done in spring and after firming the plants in, it is a good thing to top dress the soil with small stone chippings, and water thoroughly with a fine spray. Upkeep of the garden is small. 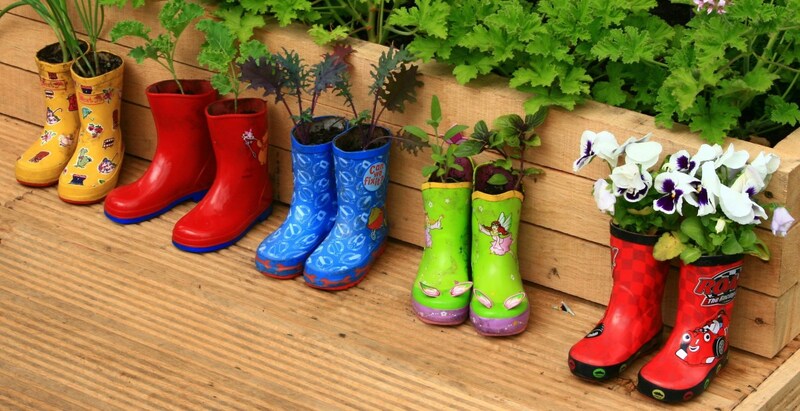 The only weeds likely to be troublesome will be airborne, and the seedlings should be plucked as soon as seen. The sink will, however, need watering whenever a few fine warm days string together. It is best done by means of a fine overhead spray that lets the water fall like rain, picking up oxygen from the air, and should be continued until the drain begins to drip. Then no more for several days. Some plants may grow quicker than expected, threatening to overwhelm the smaller, and the sink must be gardened to maintain the balance. 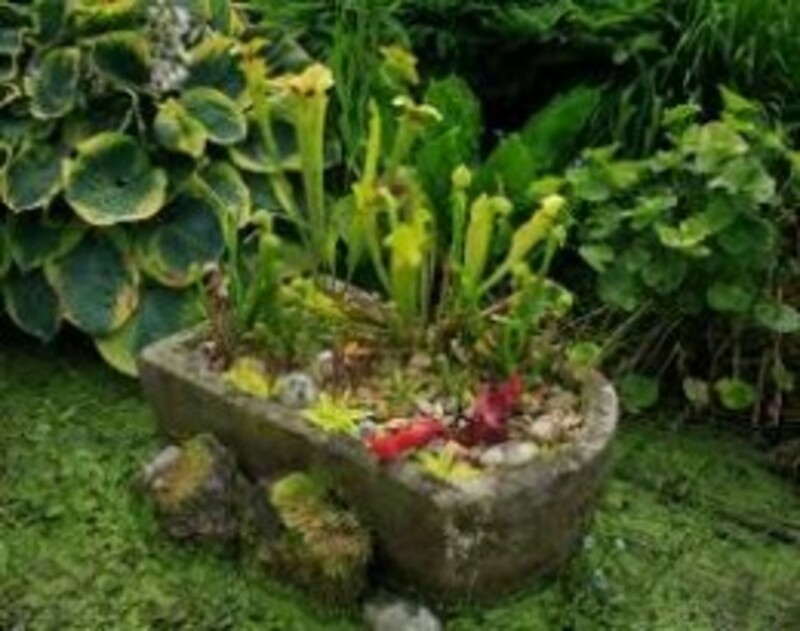 Looked after properly, a sink garden will give joy for several years, before age compels a re-making and re-planting. Campanula arvatica – Crevice or on the flat. Campanula cochlearifolia – On the flat. Campanula garganica – Near edge of the sink. Dianthus alpines – On the flat. Dianthus caesius - At sink edge. Dianthus x boydii – On the flat. Gentiana verna – Moist root run. Helichrysum marginatum – On the flat. Iris pumila - On the flat. Mysotis rupicola – Base of rock. Oxalis enneaphylla – In partial shade. Phlox douglasii – On the flat. Potentilla nitida v. rubra – Side of sink. Primula marginata hybrids – Cool. Primula rubra hybrids – Shady rock. Saxifraga cochlearis minor – Crevice. Soldanella alpina – On the flats. Daphne cneorum v. pygmaea – Slow growing, base of rocks. Genista delphinensis – On the flat, near rock. Pimelea prostrate – Side of sink. Spiraea bullata – For larger sinks. WOW! VU and more. Very detailed info. Thanks! I really like this hub! Finding old troughs can be difficult I'm sure. I like the list of plants that you've included. Thank you for the information!